The destitute situation of the urban poor especially here in Metro Manila where millions are hungry, without decent jobs, and still live in slums despite the proclamations by Gloria M. Arroyo since 2001 that the lands where they live would be theirs is the primary reason why the urban poor groups and their communities affiliated with the National Urban Poor Coalition (NUPCO) would rather conduct the SONA in their communities rather than hear the President’s SONA in Commonwealth Avenue . On the second day of the week-long community protest action that kicked off yesterday at the Parola Compound in Manila, NUPCO members and settlers in Damayang Lagi in Quezon City reiterated the call for security of tenure in the lands and houses they have been occupying for decades already. 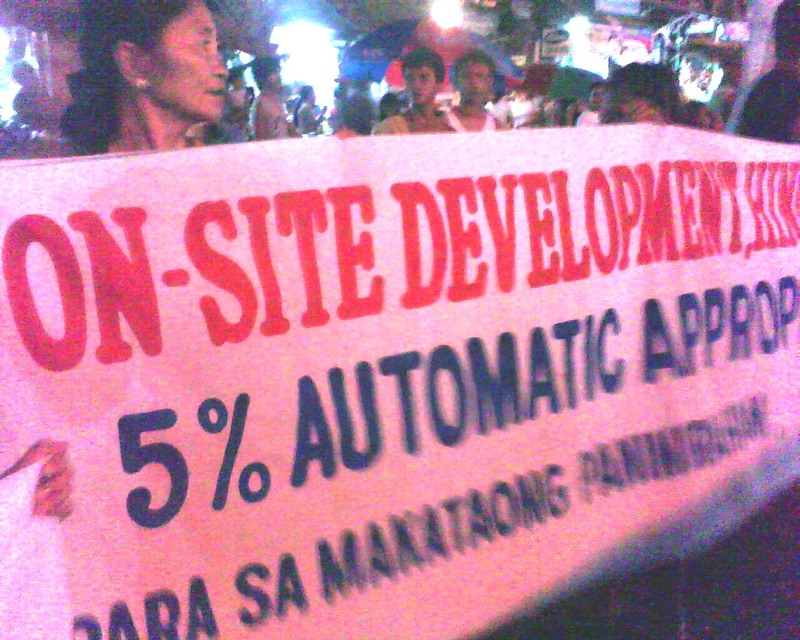 Some 1,200 families/structure owners in a 21,000 square-meter lot called Damayang Lagi, along E. Rodriguez Avenue in Quezon City, are currently facing the threats of demolition of and eviction from their homes because of the government’s plan for a mixed use of the land for housing and commercial site. “If this mixed use plan of the Department of Finance and the Quezon City government pushes through, approximately 4,800 of us who are all living here will be dislocated. Some of these people have been here since 1960’s and 1970’s,” said Noel Cano, leader of NUPCO member organization Umalab Ka that is actively campaigning for humane housing for the poor and on-site development that integrates the poor in the area. The residents through the people’s organizations and the Barangay council in the said area recently formed Task Force On-Site (TF-ONSITE) as they intensify their opposition to the mixed use plan. TF-ONSITE asserts the right of the poor to remain in the land where they have raised their families and have built a community. It calls on both the local and national governments to implement instead an on-site development plan that does not exclude the poor living in said land. “We will challenge the mixed use plan even if we have to reach the judicial courts as there seems an irregularity here in the land classification in Damayang Lagi. From 1970’s until 2001, Damayang Lagi had always been classified as a residential land. How can it be easily classified as a commercial land under zoning ordinance or land use plan of Quezon City in 2001?” said TF-ONSITE chairperson Jess Alco. Church and human rights groups joined the urban poor dwellers as they shouted “ON SITE DEVELOPMENT, NOT DEMOLITION,” while holding the lit candles at 6:30 in the evening along E.Rodriguez Ave. in Quezon City. NUPCO believes that “the government’s housing program is flawed in a major way. Poor people want and need a place in the city, not at the foothills of resettlement sites like Montalban.” The coalition added that even the proclamations declaring the lands for socialized housing appear to be fake. In Parola alone, despite the two proclamations issued by GMA in 2001 and 2004, the security of land and housing tenure of the residents there remain unrealized. Also in one part in Taguig, GMA’s proclamation in 2004 turned out to be false, that was why the people there were reportedly demolished last month. The groups asserted that GMA only used these proclamations to pacify residents who are known to distrust and dislike her. The National Urban Poor Coalition (NUPCO) is a confederation of various urban poor organizations based in Metro Manila, but with membership base also in other parts of Luzon, Visayas, and Mindanao. Seventy percent of its leadership are women and it has a total membership base of 40,000 families in Metro Manila. Through the efforts of the different socio-political groups in Laban ng Masa (Struggle of the Masses) and in partnership with the Institute for Popular Democracy (IPD), NUPCO has been working to achieve consensus on its new strategy of mobilizing the powers of local governments to secure urban poor rights that could not be secured from national agencies, like the National Housing Authority. Currently, it has a joint program with IPD “Securing a Dignified Place in the City for the Urban Poor.” The key objective of the program is to support urban poor organizations as they initiate a major shift of strategy by focusing their mobilization and lobbying strategies towards pressure on their local governments, while also exerting pressure on the national government to adopt compatible rules supportive of local initiatives. They would like their local governments to use their powers and resources to help create secure in-city urban spaces that will be co-managed, co-financed and co-developed by urban poor communities and into which needed municipal services could then flow. iv) The urban poor need to unite on their advocacy platform at the level of the cities and barangays – instead of being divided by local partisan loyalties – so that their numerical strength can be realized in the form of pressure on local politicians who need to secure votes every three years. 28 Mapagkawanggawa cor Magiting Sts.